In his last title defense, the 20 year old Filipino scored a smashing second round TKO against 2004 US Olympic alternate Torrence Daniels in Quartero, Mexico last April 26. 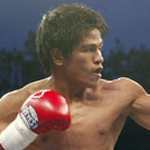 It was Concepcion’s 17th straight victory over a former amateur standout who was reported to have "surgeon-like skills." Concepcion who is managed by former boxer Aljoe Jaro and is ranked No. 7 by the WBC and No. 9 is expected to move up in the rankings following his win over Daniels which ringside journalists described as “an impressive TKO” which came at 2:42 of the second round. Jake Donovan of Boxing Scene reported that after a comparatively slow first round things “dramatically picked up-and ended-in the second." Arum told us that “sometime before the end of next year” he was planning to get Concepcion a title fight possibly against IBF champion Steve “The Canadian Kid” Molitor. Concepcion who has a record of 24-0-1 with 13 knockouts has been training at the Wild Card Gym of Freddie Roach and has sparred with a roster of tough Mexican fighters. According to WBC president Don Jose Sulaiman, Mexican fight fans have been impressed by the 20 year old Filipino. Sulaiman himself said he was personally impressed with Concepcion’s win over rugged Juan Ruiz in his previous fight, saying the Filipino “connected with the cleaner and more telling blows” despite a few individuals who criticized his performance.